On Jan. 20, public lands advocates across Wyoming celebrated a tenuous victory. In a move somewhat overshadowed by inauguration coverage, Wyoming Senate President Eli Bebout killed a proposed constitutional amendment that would have laid the groundwork for potential future transfers of federal lands to the state, citing doubt that the bill would have earned the necessary votes. Then, just ten days later, Wyoming House Majority Floor Leader David Miller filed another transfer bill, the latest in a spate of “land-grab” bills that have galvanized opposition among Wyoming sportsmen and conservationists. Since 2013, the state legislature has considered a total of nine different transfer-related bills, including ones proposing the transfer of federal lands to state or private hands, calling for related studies, or detailing the processes for the sale and management of transferred land. Those bills have been introduced against a backdrop of mounting debate over federal land management throughout the West at the state and federal level. In recent weeks, the U.S. House passed a rule package that included a provision making it easier to sell off federal lands and Rep. Jason Chaffetz (R-Utah) introduced both HR 621, a bill promoting the sale of 3.3 million acres of federal lands to ten Western states, and HR 622, which would eliminate the law enforcement functions of the Forest Service and Bureau of Land Management. Chaffetz has since promised to withdraw HR 621, in response to public blowback. Wyoming public land advocates have organized a fledgling coalition of loosely affiliated conservation, recreation, and sportsmen groups called Keep It Public, Wyoming. Though these groups have their differences, they share the fear that the passage of a public lands transfer bill at the state level would embolden Congress to make future public lands transfer possible. “We don’t want to set the stage to make this transfer easy,” says Wyoming Wildlife Federation Executive Director Chamois Andersen. This is not the first time threats to Wyoming’s public lands have driven disparate user groups together. In 2006, Citizens of the Wyoming Range, a coalition of local citizens, outfitters, and outdoor groups, helped prevent the development of a gas field in Sublette County. Their work contributed to the Trust for Public Land ultimately buying out the remaining leases on the threatened land in 2012. In early November, Keep It Public, Wyoming planned a public lands rally in Casper, which attracted about 400 people. And when the Wyoming legislature’s Select Federal Natural Resource Management Committee met the following week to discuss the amendment, about a hundred citizens “swamped the meeting,” says Stephanie Kessler of the Wyoming Outdoor Council. Most came to voice their opposition. The Dec. 14 subcommittee meeting saw even greater turnout—and opposition. The 150 or so citizens who attended couldn’t even fit in the room. 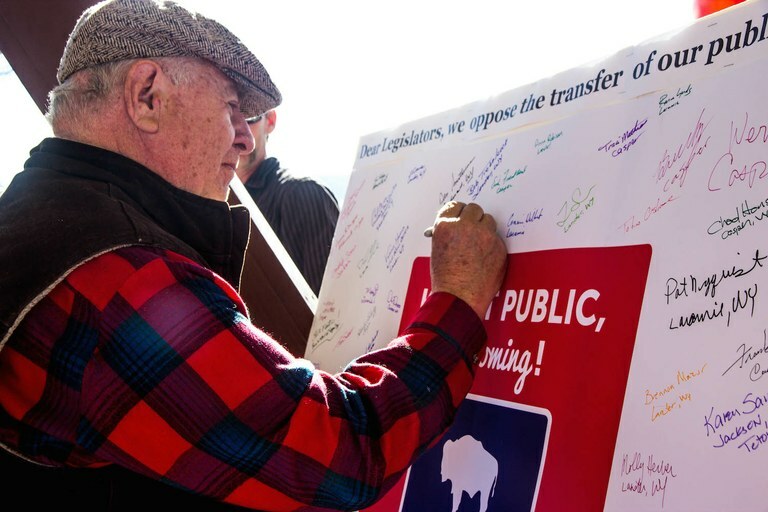 Wyoming citizens signed to show their legislators they oppose public lands transfer. Similar efforts are underway in Montana: a public lands rally at the state capitol on Jan. 30 attracted over a thousand sportsmen, conservationists, and recreationists—nearly twice as many people as attended the group’s 2015 rally. The national spotlight on threats to public lands has pushed more people into the arms of local organizations. 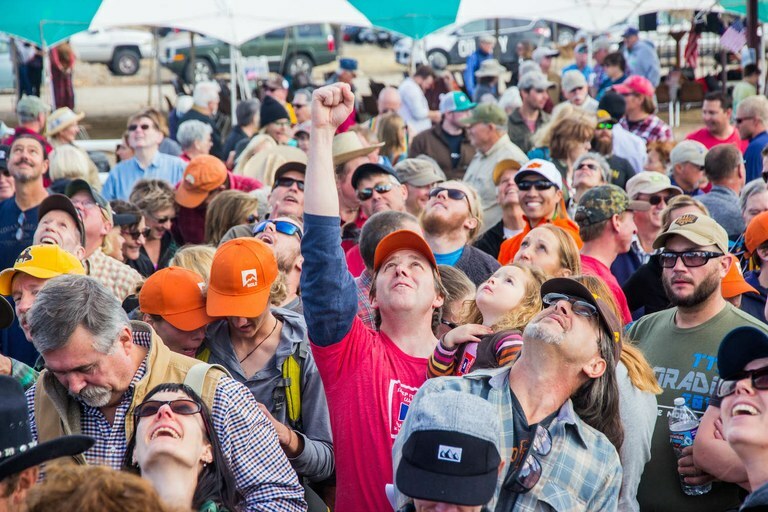 In the past, Montana Wilderness Association (MWA), which helped organize the rally, had to work to gather volunteers. Now, people are reaching out to MWA to ask how to get involved. “People are showing up that have never been a part of this movement before,” says MWA State Policy Director Kayje Booker. Correction: This story has been updated to reflect the fact that many groups, including Montana Wilderness Association, helped coordinate the Montana rally.